You own shares for the simple reason of earning higher returns. 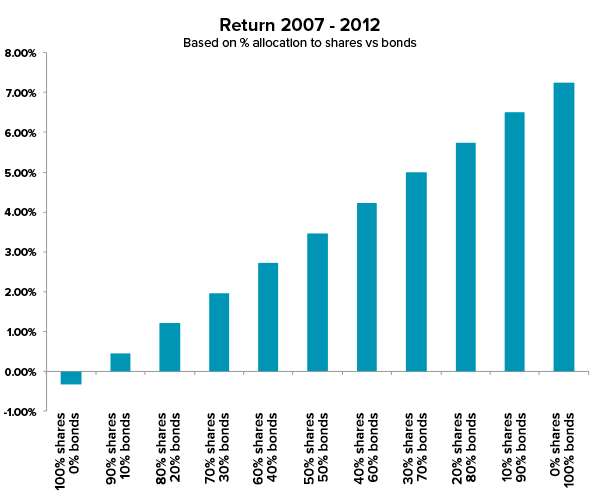 Over long periods of time shares have generated a higher return than other assets like bonds, cash or even property. You earn a higher return in shares as compensation for accepting a higher amount of uncertainty over the short run. What does short term uncertainty mean? Despite earning an average return of 11.5% per year since 1926, Australian shares can have years (or even decades) when they don’t go up at all. Over the last 20 years shares have had negative returns for 6 of those years. We know people are more inclined to buy after shares have risen, and panic when shares fall. Because of this, a portfolio that only contains shares is not usually the smart investment strategy because of the discipline required to hold during large declines. Like the one that happened in 2008/9 when Australian shares fell over 40%. Owning global shares in your portfolio is the first way to reduce the risk of being in the share market. Global shares can help you to keep earning a decent return even when your Australian shares do badly. 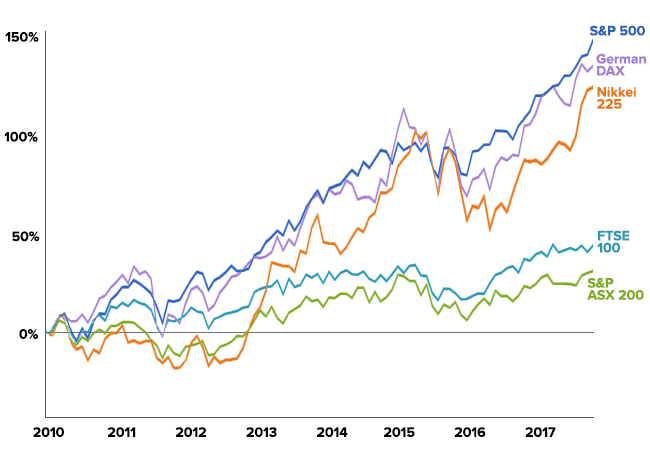 In the period 2010-2017 Australian shares lagged while global markets like the US, Germany and Japan have enjoyed large returns. This is why we own global and emerging market shares in addition to Australian shares in all of our portfolios. Our research shows that over a full market cycle, a 45% allocation to global shares has been the ‘sweet spot’ – the perfect balance between risk, return and diversification. This is why 30% to 50% of Stockspot portfolios are currently invested in overseas markets. The share market is made up of different sectors that contribute to the economy, it’s vital to diversify across different sectors when investing. The Australian market is heavily geared towards the financials and materials (mining) sectors. Global shares helps combat over exposure to these sectors as they tend to have more technology and healthcare stocks. The difference between the best and worst performing sectors can vary by more than 30% each year so you don’t want too much exposure to any specific sector or you risk losing a large amount of your money. As illustrated below, the energy sector in the US has gone from the worst to the best and back to the worst performing in just 3 years. 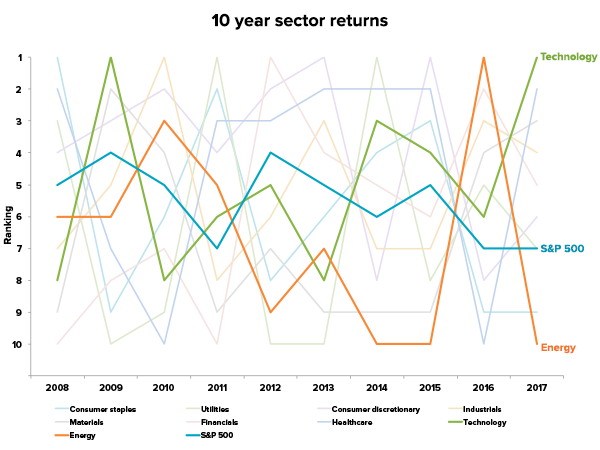 Meanwhile the technology sector which performed best this year has also had times of severe underperformance like between 2000-02 when the sector fell by 70%. So if shares give you access to the growth of companies, why would you own bonds? Bonds are a type of loan to a government or company. Rather than giving capital growth like shares, most of the return you get from bonds comes from income in the form of interest. If you don’t know much about bonds you can read about the basics here. If stocks never went down you wouldn’t need to own bonds. However shares do go down relatively often. As mentioned already, shares have fallen in 6 of the past 20 years. In each of those years, bonds went up including the 1987 crash and 2007 financial crisis. Why do bonds rise when shares fall? Bonds are influenced by different factors. Shares are driven by growth in company earnings. High quality government bonds are largely influenced by interest rates (both actual levels and changes in interest rate expectations). Bonds rise when interest rate expectations are falling and typically this happens when the economy and shares aren’t doing well. This is why government bonds provide a good ‘cushion’ to a portfolio of shares. During down months for shares, bonds rise 60% of the time. It therefore stands to reason that the higher the percentage of bonds in your portfolio, the higher the chance of having a positive return when the share market is down. 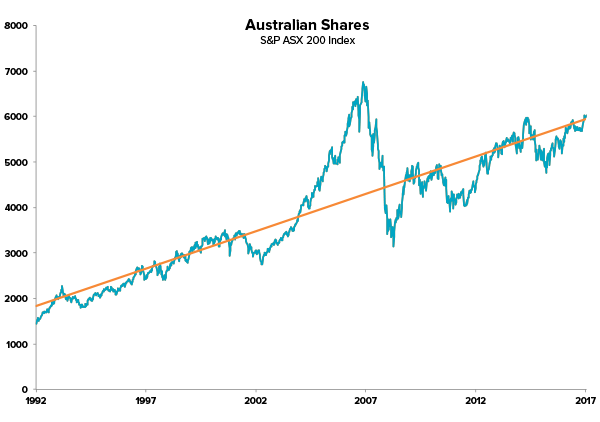 During the 5 year period 2007-2012 Australian shares fell by -0.3%. However because the RBA was cutting interest rates, bonds rose. Anyone who only owned Australian shares over that period would have lost money however those who owned some bonds did quite well. Having some bonds does not mean you should expect a negative return when stocks are up. In fact, a portfolio that is 70% bonds and 30% stocks is up 90% of the time when stocks are up. This is because bonds don’t usually fall by much when shares are rising. This is why bonds are so powerful in your portfolio – they help cushion the downside of shares falling but don’t drag you down too much when shares are rising. Even in our high growth portfolios there is an allocation to bonds for this reason. Our growth portfolio (Topaz) currently has a 19% allocation to bonds and our most conservative portfolio (Amethyst) has 52% invested in bonds. On rare occasions, shares and bonds can fall together. This why you also own gold. If shares are for long term growth and bonds are for stable income, gold is an insurance policy for when share and bonds are both performing poorly. This doesn’t happen very often, but when it does you need some form of insurance to protect your savings. In the past, shares and bonds have fallen together under a few different scenarios including rapidly rising inflation expectations, a falling exchange rate (i.e. Australian dollar) and loss of trust in borrowers. These scenarios are often interrelated but let’s look at them separately. We haven’t seen a period of rapidly rising inflation for decades. However in the 1970s inflation started at 3% and ended the decade at 15% p.a. 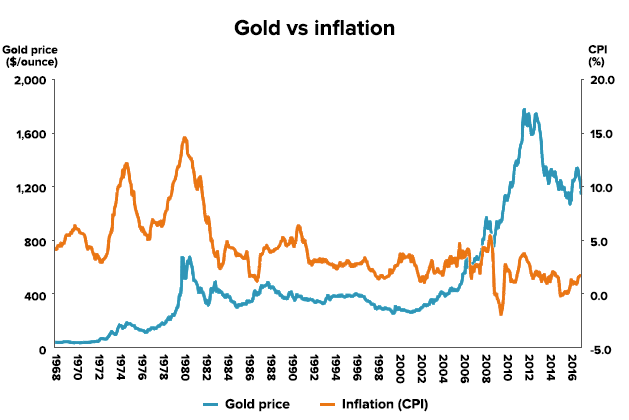 Over the same time gold rose from $40 per oz to an intra-month high of $850 in 1980. That’s a rise of 2,000%. 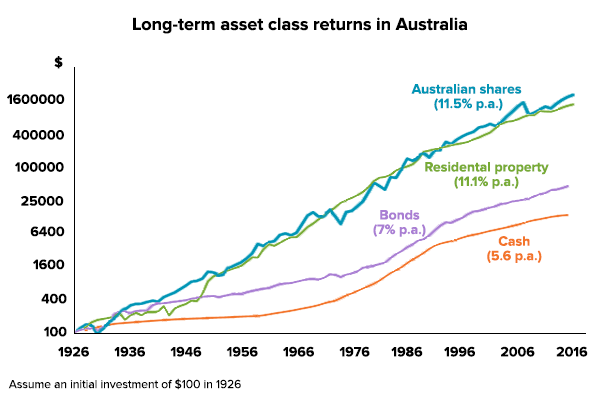 Australian shares had a negative 4% per year return and bonds also fell, so without gold in your portfolio your returns would have been poor from 1970 to 1980. The other scenario where you want gold in your portfolios is if lenders lose trust in borrowers. This happened around the time of the financial crisis and as you can see, the price of gold tripled between 2007 and 2012. A more extreme example happened in Russia in 2014 when the Russian Ruble (the Russian currency) and their share market collapsed by 50% because lenders were concerned that Russia may not repay its debt. The gold price in Russian Rubles increased by more than 50% in just a few months. Once again, a small allocation to gold in your portfolio would have saved the day when all other assets were falling. This hasn’t happened in Australia but conceivably international lenders could also pull money out of Australian bonds if they were concerned about the government’s ability to pay back debt, for example, if there were a housing crisis and the government needed to backstop the banks. Nobody knows when different assets will perform well or badly. 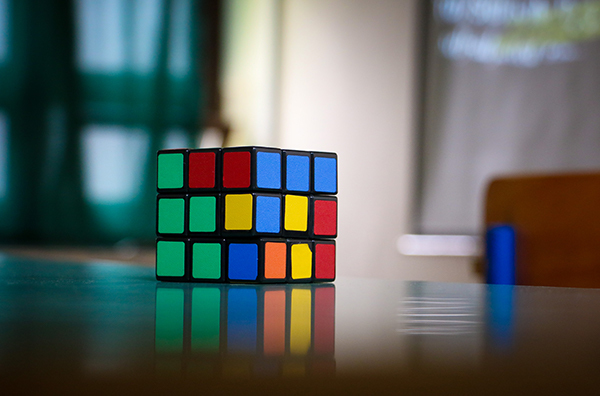 The best strategy is to have an allocation to different diversifying assets that counterbalance each-other and give you the best chance of overall success. You can think of the different assets in your portfolio like a soccer team; shares are the attacking strikers, bonds are the defensive players and gold is your goal keeper. Even if you were scoring lots of goals it would be crazy to have an entire team of 11 strikers. In the same way it’s too dangerous to only have shares in your portfolio regardless of how good their returns have been. Bonds and gold keep you in the game during the inevitable times when shares aren’t playing at their best.